Eleni shared with me how she had the good fortune of capturing an egret who was holding on to his dinner. 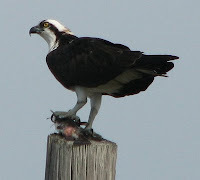 This magnificent bird had just caught a fish and was ready to dine when Eleni had the amazing luck of seeing him. She always has her camera at the ready, so she whipped into a parking lot and snapped these pictures. I would only warn you not to drive behind Eleni, knowing how crazy US 19 is and that she will do anything for a picture! According to my findings, the symbolic meaning of such a bird is self determination and self reliance. Also the tendency to be a “jack of all trades”. I have seldom if ever met anyone stronger, more self confident than Eleni. This just seems fitting! Someday she will share her amazing stories, trust me it will be a page turner! gee, as I look at my blog, I have a chicken, a spoonbill and then the egrets (fish hawks). Seems to be a bird theme going here, I wonder if that means I am a bird brain? You are anything but a bird brain. From reading your blog I see that you have some amazing friends. Those are some great photos. I am honored to be in your blog. Thank you for your kind words but you give me way too much credit. But that is the kind of person you are. Oh We are all bird brains at some time or another. MMM Is that good or bad ??? Some birds are pretty smart. And I was mentioned on your blog yesterday. What are you up to Debbie? Happy birthday. Go have some wine and a fine dinner. Thank you one and all for the good wishes. What great friends I have, you are right about that Caroline. a. maxie is good because he introduced us! eleni, you are too modest. You know I only speak the truth. I will have a wonderful evening. We have dinner plans and friends coming over. My oldest son just called me from Furman University, where he had dinner with the President of Furman and made a medical research presentation that went well. I am bursting with pride. Youngest son is actually cleaning up around here, checking for smelling salts right now. I had the most amazing birthday gift today. I will post about it tomorrow, but it was a moment shared with a four year old today.